Since graduating from RCN in 2014, I have been studying at Macalester College in the Midwestern US. As a true liberal arts student, I launched into a Psychology major with Dance, Hispanic Studies and Critical Theory minors during my first year. However, after a summer of earnest dialogues with myself, I dropped all my pre-registered classes and declared Political Science as my major. I wasn’t sure what I wanted to do with it, I just knew that it was time to learn what ‘real’ things people do in the world. Around March, as I was agonizing over hopeless internship rejections, I met a group of three Macalester students who had received a grant to pilot a project in a refugee settlement in Uganda. By May I had become a member of the team and was busy catching up on the project and planning the trip to Kyangwali Refugee Settlement in Western Uganda. Kyangwali is home to about 40,000 refugees mainly from the Democratic Republic of Congo (84%), South Sudan, Rwanda, Burundi and Kenya. We went there working with Human Centered Design methodology – learning community needs on the ground without previous assumptions and rapidly prototyping a solution-project. After a month of interviews, surveys, focus groups and research activities, we had painted a picture of Kyangwali. We decided to pilot a community organization – a business network– that would use complementary currency to help boost the local economy and support entrepreneurial initiatives. To experience Kyangwali Refugee Settlement has been the most challenging thing I’ve done in my life. Going there I thought I knew everything about white privilege and class dialectic – I was convinced I could avoid the traps of prejudice, supremacy and classism. It turned out, I was thinking exactly like a ‘proper’ elitist girl. I felt the worst when my refugee friend shared with me his plans to continue his education in the US. I hastily asked which BA degree he was considering. He humbly replied that he was looking at PhD in Epidemiology at Brown. I started fearing that I was not humanitarian enough for what I was doing there. After weeks of self-examination and feeling guilty, wondering if I could change, I started to notice and appreciate the abundance of human capacity in Kyangawali – there are so many bright, inspiring, motivated individuals who care about their community and have so much to contribute. However, since 1997 – when Kyangwali hosted first refugees, many people have become jaded by the endless struggles to survive. This is why a group of local refugees created a Community Based Organization, Planning For Tomorrow (P4T), with a vision of a healthy and self-reliant community that is empowered with knowledge and skills. In our own project, we also see sustainability and self-reliance as a key to bend the traditional dichotomy of ‘beneficiary’ and ‘recipient’. P4T’s vision aligned with ours and we partnered with them to implement the business network pilot. Despite the challenges, P4T members amazed me with their creative problem-solving. “Lack of resources creates an opportunity to innovate,” says P4T’s Executive Director, Bienvenue Byamungu. To learn more about Kyangwali Refugee Settlement and discuss how you could co-create with local people and connect with a team of refugees running P4T you can reach them at planningfortomorrow@yahoo.com or visit their website and facebook page. You can also contact me at jmakayov@macalester.edu to get directed to other resources. “Only mountains don’t meet, people do,” my Ugandan friend wrote in the first email that I read, full of emotions, after returning home. He wanted to remind me that people should re-unite and keep creating together. Our pilot in Kyangwali is still underway with incredible support from P4T and community leaders who will take over the project. The enthusiasm and courage that the Kyangwali community shared with me inspired me to always seek abundance in scarcity. Having lived in such an apparently hopeless place, I’ve never felt so hopeful in my life – what a tricky paradox! There I dared to stop just thinking and analyzing, and started doing. I’m looking forward to seeing what we co-create next. Please contact us if you would like to share what you are doing. I must admit to having been gripped with Olympic fever over recent weeks – and the force of the Olympics to unite nations through sport. We, within the United World College movement, see our role as to sustain peace, not through sport, but through education. The Olympic symbol of the five interlocking rings, designed in 1912, represents the union of the five regions of the world and the meeting of athletes from throughout the world at the Olympic Games. Our UWC logo of two rings, encompassing the globe within, echoes this symbol of unity. The Olympics, hosted by the Brazilian city of Rio de Janeiro, caught many of our imaginations with more than 10,000 athletes, representing 207 nations, competing in 31 sports, with 306 medals awarded. It has been reported that there were 3,7 billion people actively engaged through media with the Rio Olympics out of a world population of 7.4 billion with 350 million people watching the opening ceremony. Controversy of course followed the Olympics: political protests, Zika, empty seats, doping bans, unsporting behaviour, alongside the triumph and disaster of the competitors. We will all have our favourite moments. Firstly, the initiative for a refugee team competing under the flag of the International Olympic Committee – in the spirit of solidarity. Six men and four women from South Sudan, Syria, the Democratic Republic of Congo and Ethiopia. As Yonas Kinde, the marathon runner originally from Ethiopia explained to the world press: ‘We are equal now. We compete like human beings, like the others’ – sending a message of hope to all refugees in the world. A new graffiti mural in Rio now honours the individual members of the first Olympic Refugee Team. 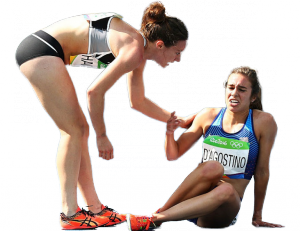 Secondly, one of the most moving moments of the games was when a New Zealand and an American runner stopped to help each other after a collision in their heat for the 5000 metres. 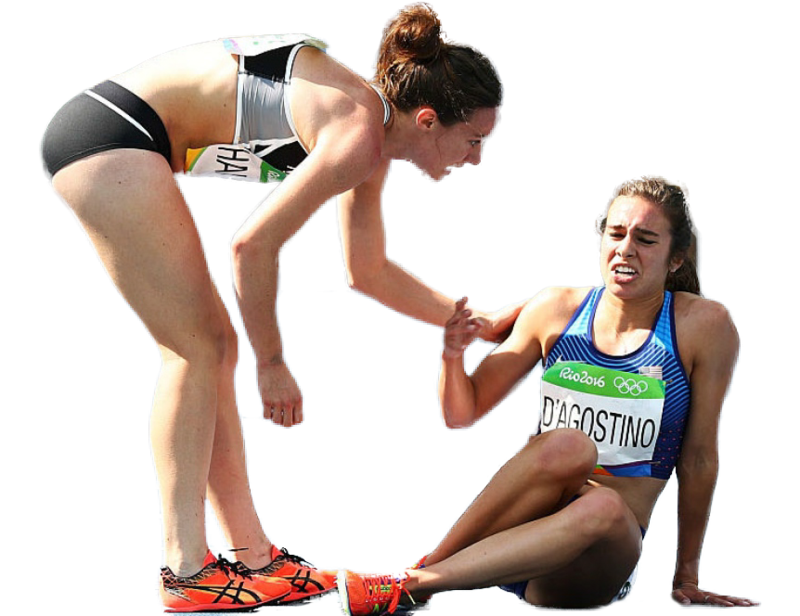 An encapsulation, for me, of the Olympic spirit. The values of friendship, respect, harmony and peace are at the heart of both Pierre de Coubertin, the founder of the modern Olympic movement’s vision and the vision of the United World College movement. The games provide us with an opportunity to gather every four years, when the world is often faced with turbulence and trouble – and to strive to celebrate what is best about mankind. With the Olympics in mind and as we set out on the next academic year, we must all seek to do, and be, the best we can. 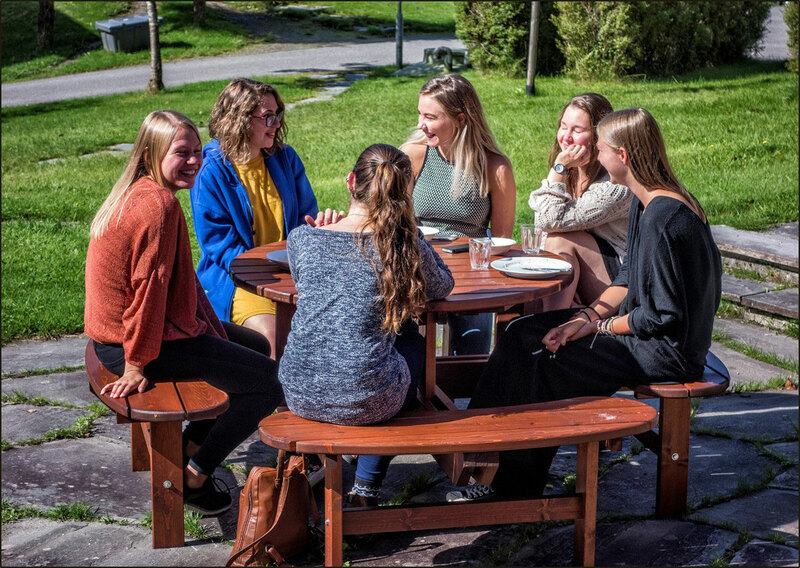 Five students from the Knights EAC drove ten hours with Hilde to take part in Ridderdagene in the South-East part of Norway – and had a fantastic time there over the weekend of 18th to 21st August. Ridderdagene (The Days of the Knights) is a weekend where many volunteers do all they can to make summer sports and activities accessible and inclusive for people with various kinds of disabilities. 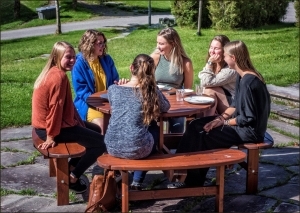 Every year since Ridderdagene took place for the first time in 2013, the College has sent a delegation of students and staff to volunteer and take part in the event. It was very nice to meet people who remember UWC RCN students from previous years and from the big winter sport event – Ridderrennet. Anyone can take part in the Saturday bicycle races, where you set your own targets: to make it until the finish line; beat your own personal record; or, if you are more ambitious, try to keep up with laureates from the Paralympics. 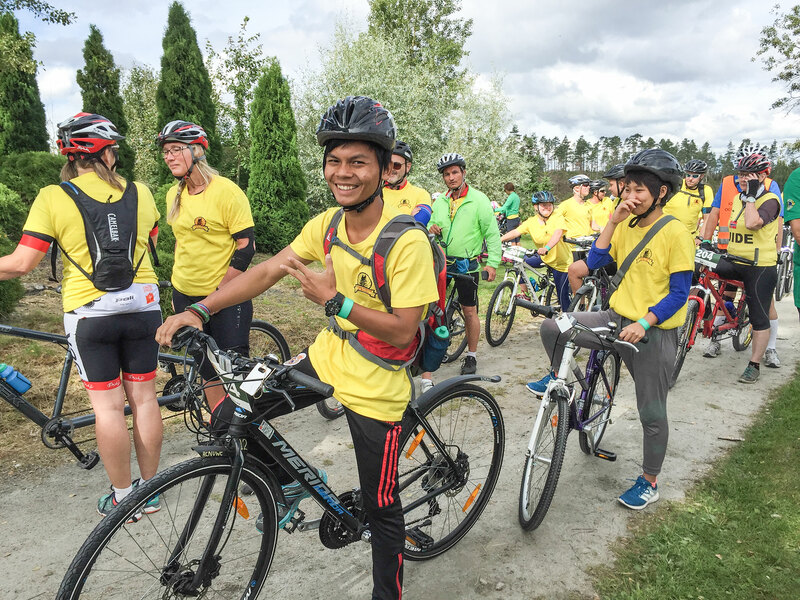 Mean and Sreythai, both Cambodian students in the Survivors of Conflict programme, represented UWC RCN brilliantly by biking respectively 40 and 5 kilometres with the times 1 hour 46 minutes (40 km) and 16,5 minutes (5 km). Apart from the bicycle race, there are lots of other activities for children, youth and adults – like horseback riding, yoga, an obstacle course, sailing, canoeing, painting classes for children or a walk through the sense garden which is especially designed to give blind people an interesting experience. 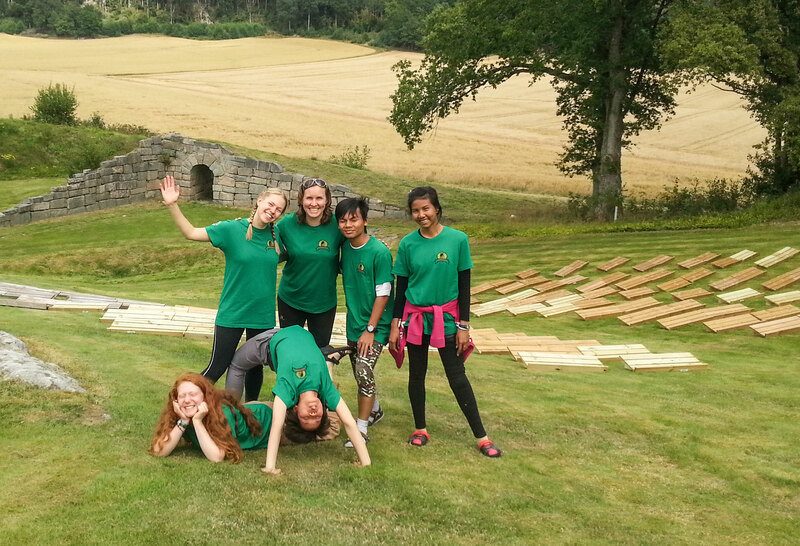 We lived with the scouts and some other participants in a tent camp on Erling Stordahl’s farm and got to know participants and volunteers through participation in activities and by sharing meals around the outdoor dining table that the scouts had made. 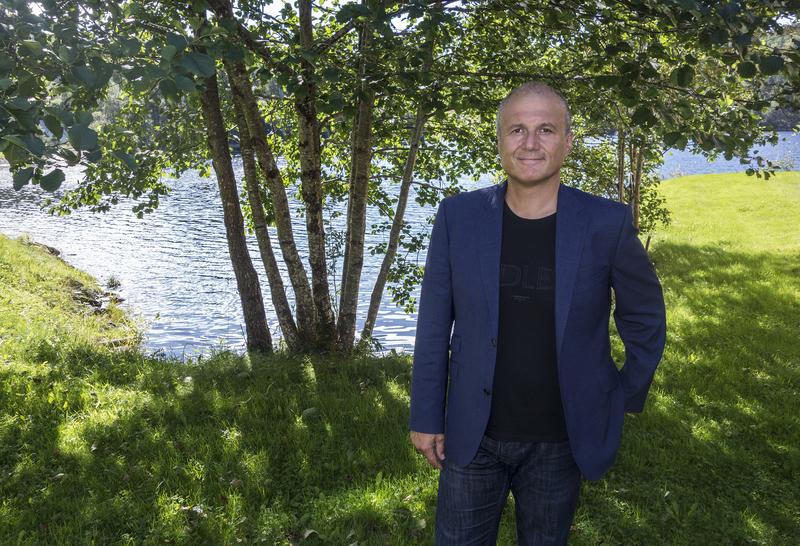 Erling Stordahl wanted to use sports and culture as arenas where people with different kinds of disabilities can meet and integrate. According to Stordahl, we are all disabled, somehow, and we just need to find our own ways to take part in things. This year the cultural part of Ridderdagene was mainly opera and classical music performed in a very inviting, child friendly and funny way, and our very own Mai charmed everybody with a beautiful song about Vietnam. More information and pictures are found on facebook and the Ridderdagene webpage. 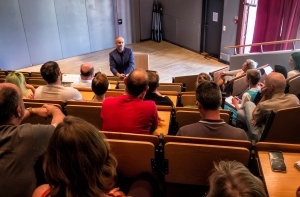 On Monday, Pellegrino Riccardi was invited to the College on the recommendation of Hilde Genberg (RCN’s Survivors of Conflict Programme Coordinator and formerly the College coordinator of the Fredskorps Partnership) – Hilde had previously heard Pellegrino speak at the annual FK summer camp on inter-cultural understanding. We put together a programme for Pellegrino so that he could run a seminar for our second years (with the intention of helping them to prepare for and reflect on the arrival of the incoming first years) and so that he could run a training session for our Education Staff (with an open invitation tour Support Staff) on intercultural communication and understanding given our deliberately diverse student and staff bodies. The training was insightful, humorous and thought-provoking – and we certainly hope to invite Pellegrino back to our campus for further training. 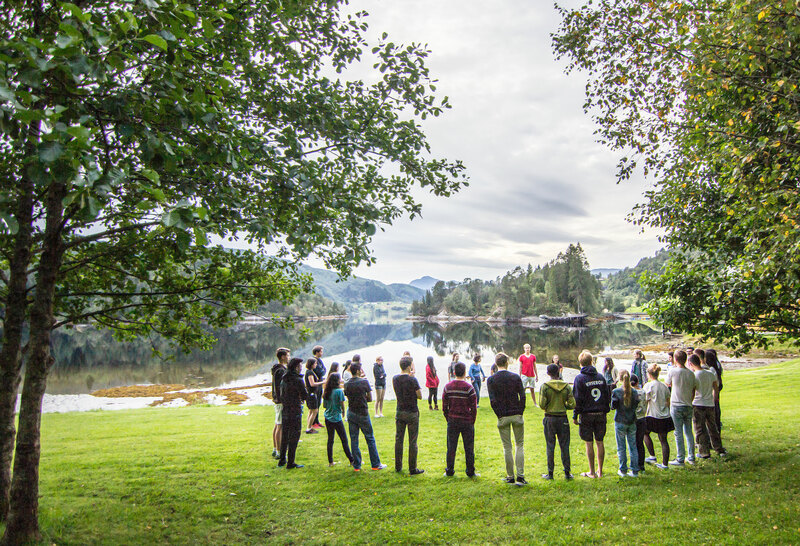 The training for staff also complemented the training delivered in our Staff Introduction Week on the three pillars (Nordic, Humanitarian and Environmental), communication skills and a (re)introduction to inter-cultural understanding. For more information on Pellegrino’s work, click here for his website and here for a link to Ted Talk he delivered in Bergen.